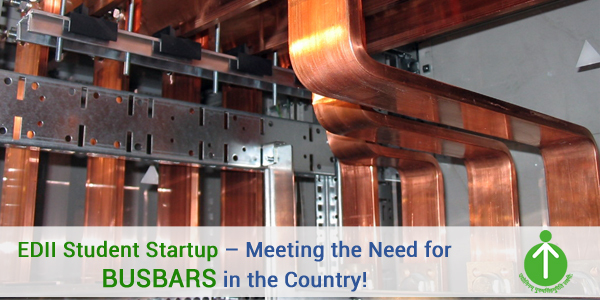 EDII Student Startup – Meeting the Need for Busbars in the Country! Startups are fast beginning to make a name for themselves across the country with all that they are achieving. It wasn’t long ago that a new startup, started by our student Rishabh Hundia which aims at meeting a production gap for busbars, took its first steps into the world. The idea that laid the foundation for the emergence of Bus bar Manufacturing arose when the Rishabh Hundia was attending a ‘Make in India’ conference. It was at that same moment that the student’s father advised him to look at the copper bus bar market and see if that line of business appealed to him. Belonging to a family that has been in the metal industry for the last four decades, Rishabh Hundia has always been around metals and had grown up with the desire to work with them. This was what gave birth to a love and attraction towards metals, right from a young age. This was how the first seeds of a Bus bar manufacturing startup came to be planted in his young, innovative mind. The way a bus bar works is that it conducts electricity within various heavy electrical appliances. It is also used for switchboards, substations or distribution boards. Copper busbars are very useful for power grids as they help bring down the power loss substantially. They are used to conduct a substantial current of electricity but the amount of current that can be carried in them depends on the composition of material used and the cross-sectional size of the busbar. However, the current condition of the metal industry as a whole is not at a very good place, on both the national front as well as the international front. So given that the industry is in a difficult situation, right now this young entrepreneur is working on learning about the situation in the country so that he can come up with a good plan of revival. If all goes well, the future for copper busbars is likely to be bright. By trying to stick to the ‘Make in India’ policy, wherein the Government focuses on setting up manufacturing units in India, there is certainly a lot of potential for this company to grow. There will certainly be a lot of demand for the product by new manufacturing units that will require it for electrification purposes. However, currently copper busbars are being imported in thousands of tons into the country and since 2010, the demand for them has been growing at 11 percent every year. How Has EDII Aided the Growth of this Startup? EDII has been a learning ground that provided mentors and the right faculty to bring Rishabh Hundia’s idea to fruition. Not only do they strive to turn students into entrepreneurs but they also provide entrepreneurial experiences in different sectors. After EDII scrutinized the student’s DPR and once it had received the stamp of approval by various industry experts and learned faculty, it gave this young entrepreneur the confidence he needed to venture out and put his idea to the test. Many students that have passed out of EDII has testified to say that the institution does provide the best faculty and mentors who help students turn their ideas into a reality and this was what was responsible for Busbar Manufacturing becoming a reality and one with a bright future awaiting it. What’s more, EDII also provide the much needed seed capital to its deserving students to help their start-up idea see the light of the day. EDII Student Startup – Enzo Daily Car Wash! Even though most of us live in a world where owning a car is a necessity, some basic maintenance needs to be followed. The most important one being- getting your car washed from time to time. A regular washing job helps protect the exterior of the car and ensure that the dirt and grime does not eat into the paint. However, washing the car without the right tools can be a tiring and time-consuming job. This is why car washes are increasingly sought out by car owners who don’t have spare time on their hands. 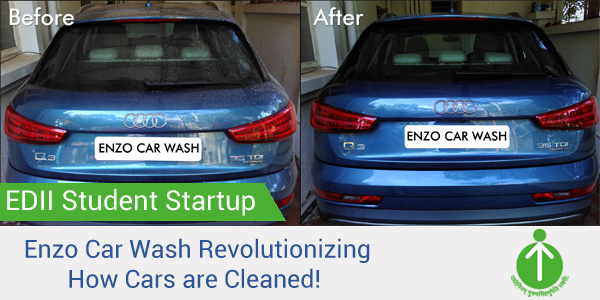 This is where Enzo Daily Car Wash – a recent startup by our student Rahul Gonsalves – comes into the picture. When cars are washed on a daily basis, a practice that is rampant today. there is always a lot of water wasted. After two to three months, the surface of cars starts to look dull. This is because servicemen mostly use unclean practices and follow an unhygienic process of cleaning wherein the same water and cloth is used for over 10 cars. This results in scratching the surface of the cars and causing them to look dull. It was this observation that led to the idea of providing customers with a ‘waterless, one cloth per car’ service. What Does Enzo Daily Car Wash Have to Offer? Enzo Daily Car Wash has been designed to provide a quick, waterless solution to professional car care. The product used is a high lubricating mixture that removes the dirt from the surface of the car and leaves it with a shiny finish. This product that they have created is an in-house product that has proven to be effective but which is not up for sale so you are not likely to find it elsewhere. Currently, the startup provides prompt home service to customers. All you have to do is give them a call and they will have their team at your doorstep to wash your cars every day. Daily customers will be provided the service at an average cost of Rs13/- per day while retail customers will have to pay Rs. 50/- for the job. These prices are the lowest in the industry as this startup aims to provide you professional car care at affordable rates. The reason they are able to provide their services at such low rates is because they have created a unique value chain of self manufacturing where they manufacture all related products themselves and use it to provide the service, this refuces the swelling of costs due to supply chain intermediaries. Currently providing their car wash services in 11 residential complexes, they are still looking to expand and are expected to start their service in four more localities by June 1. The startup has already partnered with a leading oil company and has set up wash stations at 25 petrol pumps along with an exclusive full wash outlet. How EDII helped Enzo Daily Car Wash? EDII aided the young entrepreneur in perfecting a business model for the startup. The knowledge and input offered there helped create an exclusive system of manufacturing and customer acquisition where they can service 321 cars with an investment of just Rs 1,20,000. EDII has assured Rs 3,50,000 as startup capital against the money invested. With the rate at which the company is growing, it expects to save at least 3,00,000 liters of water by December 2016 due to the direction and assistance offered by EDII. Most of the funds will be utilized to help the startup reach out to new customers.